When it comes to the guests' enjoyment of any event, food and beverage are nearly as important to an event as the purpose of the event itself. As the event planner, you will likely be responsible for working with the catering professional to plan the food right down to selecting each menu item for your group. Whether you're working with a private caterer or the catering manager at the event venue itself, it's always helpful to consider several factors before building the menu. The first thing to remember is that the menu options they present are almost always 100% flexible. And even though most caterers will allow you to confirm the menu and headcount about three weeks prior to the event, confirm the menu much earlier in the planning process. Here's what you need to know before you get started. Breakfast: When it comes to breakfast, packaged menus are usually more cost-effective and easier to select, including continental options, hot buffets, and breakfast stations. If you're offering breakfast prior to the start of the official program, be sure to choose the option that best suits your event's schedule. 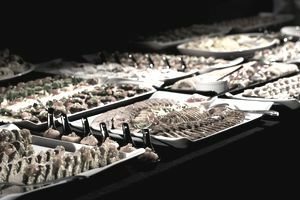 Lunch: Most caterers offer several lunch buffet options, "working lunch" choices (such as à la carte sandwiches and appropriate sides), and even boxed lunches. Again, the best choice of meal type will be entirely depending on your program's schedule so consider how much time guests will have to eat. Dinner: You always have a choice of packaged dinner buffets or plated dinners, and both can offer a choice of three to five courses. This is where you will find items that reflect the executive chef's personal preferences and is also generally a time to let the food shine. Break Items: If your budget can afford it, theme breaks are always more interesting than standard beverages and snacks. Receptions: Most caterers offer à la carte options for passed chilled and hot hors-d'oeuvres and hosted bar reception packages (charged hourly per person or on consumption). They also may offer cold and hot platter stations as well as dessert stations. The Big Dinner Question: Buffet or Plated? Plated: Plated meals require at least 1.5 hours, if not 2 hours, of agenda time to properly serve and clean the room. Plated meal service is most commonly used for dinner and relaxed senior executive meetings. Buffet: Try to allow up to 1 hour of agenda time for any buffet meal. Buffets are a great format for breakfast and lunch. Passed Items: While a great option for hors-d'oeuvres, passing serving is typically only used during receptions. The only way to know about such special needs is to ask, and the only way to plan for them is to discuss them with your catering professional as soon as possible. Catering minimums: Most meals require a minimum headcount and charge on a per person basis. Labor charge: A minimum charge applied to set up your event; however, often negotiable and waived if the event meets minimum fees. Chef fee: Charged if your event uses a carving station. Bartender fee: Charged if your event requires bartender services. Room rental fee: Often negotiable and waived if the event meets minimum fees. Service charge and sales tax: Anticipate 20 percent or percentage identified as a service fee, and local taxes.